A story about mayonnaise has sparked a heck’va backlash online. AH, mayonnaise. Such a polarising entity. Some of us embrace the white goop as a versatile member of the condiments society. You can add it to your sandwich. Dollop it onto a piece of chicken. Stir it into a salad. Others - like Jimmy Fallon - despise the stuff with a passion. But never has the debate around mayo been more contentious than it is right now. 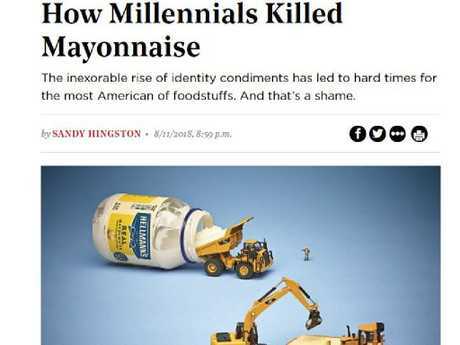 Earlier this week, Philadelphia Magazine senior editor Sandy Hingston came out with a story called "How Millennials Killed Mayonnaise". "Good ol' mayo has become the Taylor Swift of condiments," she edgily declares. "It's too basic for contemporary tastes - pale and insipid and not nearly exotic enough for our era of globalization." A shattered Hingston laments the fall in enthusiasm for recipes passed down through her family - her mother's potato salad, her macaroni salad, a "painstakingly prepared" Waldorf salad - that have been destroyed by an unstoppable millennial thirst for all things exciting and exotic. To illustrate the condiment's former ubiquity, she writes: "How do you think 'Hold the mayo' became a saying? There was always mayo, and if you were some kind of deviant who didn't want it, you had to say so out loud." Then those silly millennials - with their rolled-up chinos and their quiffed hair and their inability to afford a home in a systematically broken market - decided to murder the trend. She does offer one suggestion - Gen Y is just too damn feminist. "My son Jake, who's 25, eats mayo," writes Hingston. "He's a practical young man who works in computers and adores macaroni salad. He's a good son. "I also have a daughter. She was a women's and gender studies major in college. Naturally, she loathes mayonnaise." As we all know, gender studies is a gateway drug. One minute you're advocating for equal pay. The next, you're violently slathering your dishes in Sriracha while the poor, oppressed mayo curdles in its metaphorical grave. "Ask the young people you know their opinion of mayo, and you'll be shocked by the depths of their emotion (about mayonnaise)," she continues. "Oh, there's the occasional outlier, like Jake. 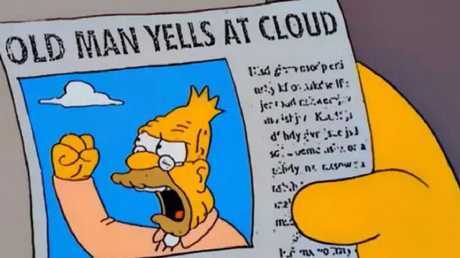 But for the most part, today's youth would sooner get their news from an actual paper newspaper than ingest mayonnaise." "Young people like my daughter somehow seem to have extrapolated this masking function from condiment to culture; for them, mayo quite literally whitewashed America's immigrants into eating dull food," she writes, presumably after cutting her daughter out of her will. "And newer generations are refusing to meekly fall in line with a culinary heritage that never was theirs. Instead, they're gobbling up kefir and ajvar and chimichurri and gochujang again." In other words, these filthy millennials are getting so caught up embracing food trends of other cultures, that they're destroying this lady's macaroni salad. Once you've taken 30 seconds to mourn a stranger's family's lumpy white recipes, let's get to the data: have millennials killed mayo? According to a Wall Street Journal report, mayonnaise sales fell 6.7 per cent in the United States between 2012 and 2017. 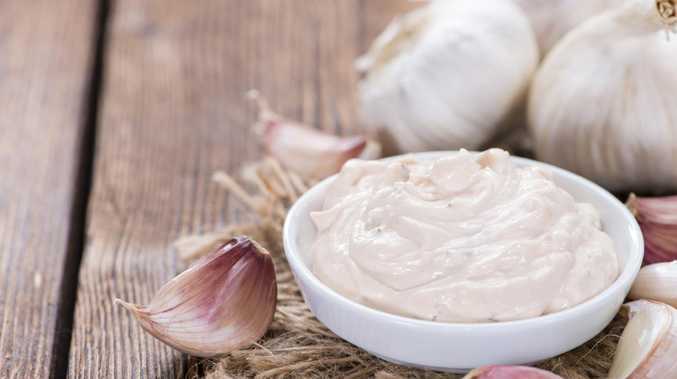 This is due to increased competition between condiment brands, a rise in health-conscious shoppers axing the calorie-dense sauce from their diets, and - well, yeah, the fact that our variety of food choices has never been greater. So … yeah. Hingston may have a point. RIP, eggy white goop. We hardly knew ye. Is it a loss worth mourning? Don't ask me. I have three bottles of Sriracha sauce sitting in my fridge.